Item: AM1052 P-1618 - Hyde park corner, London. Item: AM1052 P-1226 - Ice moving - Assiniboine River. Item: AM1052 P-1559 - Ilfracombe, from Hillsborough. Item: AM1052 P-239 - In Chinatown, Vancouver, B.C. Item: AM1052 P-807 - In picturesque Beacon Hill Park, Victoria, B.C. Item: AM1052 P-639 - In picturesque Stanley Park, Vancouver, B.C. Item: AM1052 P-603 - In Stanley Park, Vancouver, B.C. 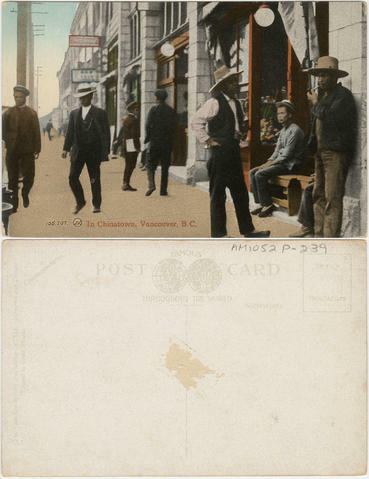 Item : AM1052 P-239 - In Chinatown, Vancouver, B.C.